Easy to carry, fashion design, save place. The net mesh bag can filter the sand and dirt after using the ball. It’s suitable for volleyball, basketball, football and so on. You also can put your clothes or shoes into the bag. Suitable for Gym, school, swimming pool, beach and so on. Ships from Hong Kong. 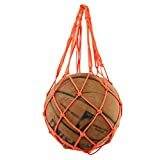 A basketball mesh bag is a lightweight ball bag that can hold official size soccer basketball or volleyball, and can be easily compacted for storage when not in use. Easy to carry. It’s suitable for soccer, basketball, volleyball football or storage some small items while go travel or exercise, such as the shoes, clothes and so on. Just sell the mesh bag, not including the ball.